Image caption Was the mysterious figure behind Elizabeth Templeton a spaceman? On a bright summer's day in 1964, a Carlisle fireman took a photo of his daughter that created headlines around the world. 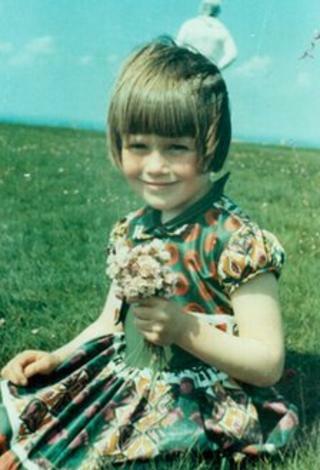 Fifty years later are we any closer to solving the mystery of the "Solway Spaceman"? "We went on a normal outing and picked our spot," Jim Templeton recalled in a BBC interview before his death in 2011. "We sat down and I said, 'Now I'll get some photos of you with the new dress on', never expecting this to happen." By "this" he meant worldwide media attention and decades of debate over the mysterious figure shown behind his daughter, Elizabeth. For UFOlogists, it was clear. A white suit. A helmet. A dark visor. Mr Templeton, they believed, had photographed a spaceman. Other than his wife, Annie, and two pensioners sat in a car, the Carlisle fireman maintained he had not seen anyone else that day on Burgh Marsh, overlooking the Solway Firth in Cumbria. It was, he said, only when the chemist who processed his pictures pointed out the shot had been spoiled by a figure that he realised there had been somebody - or something else - present. Mr Templeton took it to police in Carlisle, who declared there was nothing out of the ordinary. Film company Kodak said the same and even offered a reward to anyone who could prove the photo was faked. It was never claimed. But a media frenzy soon ensued. "It came to the attention of the local paper, the Cumberland News. From there it ran and ran. It was picked up by the Daily Mail and Express," said Dr David Clarke, an author on UFOs. Mr Templeton began receiving letters from all over the world. "Some people claimed it was a spirit, others believed Jim or his daughter had psychic powers they had not been aware of," Dr Clarke said. "It got weirder and weirder and weirder." Then came a visit from two "Men in Black" who asked to be taken to the spot where the image was taken and referred to each other only as Number 9 and Number 11. Upon later seeing the Solway Spaceman picture on the front page of an Australian newspaper, they were said to be stunned as the figure looked the same as the figures they saw close to the missile. The plot thickened as the Blue Streak had been built at RAF Spadeadam in Cumbria - just a few miles from where Mr Templeton photographed Elizabeth - and as the story gathered momentum it was also claimed a UFO had been seen at Woomera. So could those incidents really be linked to events in Cumbria? No, said Dr Clarke, who has seen the black and white film of the aborted launch. "I came across all the paperwork in the MoD files about five years ago. It turned out the film was at the Imperial War Museum in London," he said. "It looked like a triangle of light - it was clearly lens flare." As for the technicians' claim of seeing two men in the firing range, he said no photographic record of that sighting exists. Regardless, Mr Templeton's picture had tapped into a public interest fired up by the space race between the United States and Soviet Union. "There was a whole series of photos, usually taken with Box Brownie cameras showing flying saucers like you would see in Dr Who, War of the Worlds and B-Movies," said Dr Clarke. "Looking today, some seem naive. "But Jim's is such a distinctive picture. The image behind the little girl is so obviously like a Nasa astronaut." Sarah Spellman, chairwoman of the Association for the Scientific Study of Anomalous Phenomena (Assap), agrees it was a product of its time. "It's an interesting curiosity. Once you see it and make that spaceman connection, it's quite a striking photograph," she said. "It struck a chord with the themes of the day and some of the UFO lore of the 1950s and 60s became attached to it." For Dr Clarke, who has a PhD in folklore, stories such as the Solway Spaceman follow a well-worn tradition. "Ever since the invention of photography there have been pictures of angels, fairies and spirits," he said. "A lot were [explained by] lens flare or had been tampered with, but it fed into greater spiritualism in the 19th Century. "If Jim had taken his photo in 1864 instead of 1964 he would have taken it to the spiritualist church and they would have said it showed a ghost." Assap, which has been investigating the anomalous and paranormal for more than 30 years, still receives "a steady stream" of new cases annually although the majority now centre around claimed sightings of ghosts rather than UFOs. "Our ability to analyse has advanced, but so has the ability to fake things," Ms Spellman said. "People now have access to Photoshop and CGI. If someone wants to fake something they don't have to put a cardboard cut-out in the garden and hang it from the fishing line anymore." But what could explain the Solway Spaceman photo? Could it simply be a hoax? Dr Clarke, who met Mr Templeton in 2002, thinks it unlikely. "I came away absolutely convinced he was telling the truth and couldn't explain it himself, although I was less convinced about his 'Men in Black' story. Whoever it was who visited him, I don't think they were from the government." "One of the other stills [taken that day] shows Jim's wife who, according to him, was standing behind him when he took the photo of Elizabeth," he said. "I think for some reason his wife walked into the shot and he didn't see her because with that particular make of camera you could only see 70% of what was in the shot through the viewfinder." Annie, he argues, was standing with her back to the camera and the photograph was over-exposed - causing her blue dress to look white. Whatever the truth, for Dr Clarke it is a reminder of a more "innocent time" and he is in no doubt about its importance. "People now are much more cynical about these kind of pictures," he said. "Back in the 50s and 60s you got a few grainy stills showing extraordinary things. People were much more surprised and willing to suspend disbelief. "For me, it's one of the most impressive anomalous images in supernatural investigations and people will still be talking about it in another 50 years." What was it really like working on UK's 'X-Files' ?